I've read countless books, articles, and blogs about losing weight. I have been on a ton of different eating plans. through trial and error I have discovered how to take off my excess pounds, and I have lost weight on many occasions. In my adult life my weight has been as low as 260 and as high as 350 and everywhere in between. I'm 42 years old and most days I feel exhausted from carrying all this bulk around. My knees are showing early stages of arthritis; I already suffer from knee pain at night. My kids are entering their teen years; there's still a lot I need/want to be able to do with my family. I'm sick and tired of being sick and tired. So I am motivated and I know how to do it, so how come I don't lose weight??? This year has been all about shifting my mindset and smashing perceptions that are not real. Today I might need to smash another one of my perceptions... that I have tons of character. 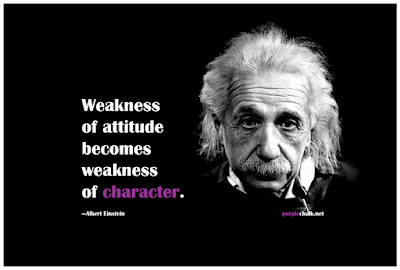 Character is something that you have no matter what anyone else thinks. Character drives you to do great things, it helps you to deal with the tough situations, and it defines who you are. Naturally we all think we are full of character, but the reality is that most of us don't have nearly as much as we like to think. For years I always assumed that it must be some missing piece of the weight loss puzzle that kept me from dropping the pounds. I explored the mental and the physical looking for that one thing I was missing. The truth is, it's not the weight loss puzzle I need to solve; I need to improve my character. Now don't get me wrong, I'm not saying that I have no character. What I'm saying is that one part of my character, the part about keeping commitments, is very weak. I have a hard time staying committed to anything for too long. I may have been with the same company for 10 years now, but in that time I've worked at 3 different facilities. I don't stay committed to any one location for too long. The same goes true for personal development, I make a commitment, but can rarely stick to it for any meaningful period of time. I say my ability to keep commitments is weak but I know it's not non-existent. For starters, I've been married for 17 years so I know it's possible for me to make long term commitments. It's just something I need to work on. I don't like admitting that I lack character, but it's something I need to do if I'm ever going to improve. 141 Days down; on to Day 142. Self reflection can be hard sometimes. I'm struggling with it myself. But there IS no meaningful change without it. I laud your efforts. You know, the thing is that MOST people have trouble with losing weight. Some of it is personality and character, sure, but a lot of it is a great deal more complicated than that. It's not in our biology to restrict food. Nature is about survival, and for the bulk of our time on this earth that has been about eating when we can. This age of the plentiful is NEW, and we are NOT programmed for that. So, we have to fight our natural instincts to lose weight. We also have to fight the changes in culture that allow for so much inactivity. I am very much anxious about my weight.